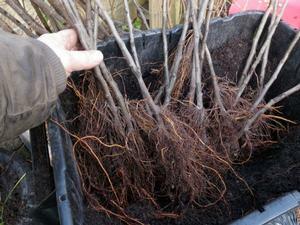 Grafting your own fruit trees. Some backyard orchardists just can’t resist the challenge of “doing” their own trees. Start with high quality rootstock. Sometimes the challenge of doing something yourself is just too much to deny! That is why we offer rootstocks for the backyard nurseryman on Grandpa’s Orchard. You have an heirloom, that can’t be identified, that you want to save. You have special conditions where you need a scion/rootstock combination that cannot be purchased anywhere. Being a nurseryman can be very satisfying, however getting the years of experience to become a good grafter and propagator can be heart breaking. There are many skills in growing a good tree that can take years to really develop. Expect some failures— but don’t be surprised if “beginner’s luck” happens! Often, out of sheer coincidence everything comes together the first time around, but then seems like it can never be repeated, no matter how hard you try! Stick with it though, the results are definatley worth it. Plan ahead. Look for rootstock now. Locate good scionwood. Your results will not be good if you wait until the last minute to decide to do some grafting. Good results can be directly attributed to using quality rootstock, excellent scionwood, and well- honed technique. Keep notes, records, and pictures of what you are doing, so that if you are successful, you can repeat the results consistently. Start with something a little easier such as apples or pears; stone fruits are much more difficult. If you are a real serious hobby grafter Grandpa has good news for you. He has just made a distribution agreement with a highly experienced New Zealand horticulturalist who has developed a line of professional grafting tools which will make grafting more efficient and productive. These are professional tools that can’t be compared to the cheap grafting tools others offer. Cheap tools may work well enough for the hobbyist, but these well engineered and machined tools are much more expensive and designed for professionals, like me! A link to the website we are developing for them will be posted on Grandpa’s Orchard sometime in the near future.